If you study the history of chess pieces you quickly see that chess is a game which gives us significant insight into countless civilizations across the Far East, the Middle East, North Africa and Europe. Since the origin of chess, the game evolved in many different forms to reflect many different societies in many different places and times. Although the dimensions and style of the game board varied slightly, for the most part it has been 64 squares of alternating colors, light and dark, 8x8. The main changes down through the centuries and across the known world such as it was have been in relation to the pieces. This is because the pieces represent prominent figures in each society. Each variant took shape to reflect the main political, cultural or military characters in each particular civilization when chess was introduced. When the Indians developed chess they modeled it on their army. Each piece represented an arm of the military. The pawns were styled on the infantry on the front line. Not much changed as the Europeans saw them in a similar light. The pawn represented a foot soldier or a common peasant. For this reason the pawns line up on the front line. It only marches forward, is used to hold the line and like cannon fodder is often sacrificed for a higher purpose. The Europeans gave it a gee up by allowing 2 squares on the first move to speed up the game. Maybe promotion represents the little guy's dream to a tee. Work hard, fight like a tiger, survive the odds and maybe you can move up in the world. The knights represented the cavalry on the chessboard. The distinctive move is unchanged since the piece was invented. The knight like the cavalry doesn't charge directly at the enemy. As it moves in it veers to one side in an effort to outflank the opposing forces. This is where the knight's movement comes from. Some people say the knight ended up with this move because the knight starts between a rook and a bishop. It moves one square like a rook and continues in the same direction one square like a bishop. Other people say that it's because all other conceivable movements were taken already. It was the only movement remaining. Along with it's ability to jump all blockades, with it's distinctive movement, it is pretty hard to imagine chess without the knight. Maybe that's why it's movement was never changed. Don't mess with perfection. This piece originally began life as a symbol of the elephants in the Indian army. It's original movement was 2 squares diagonally in any direction. It was a piece of only moderate power. It was only when the game was carried to Europe that it's fortunes began to improve. The Europeans were not as familiar with the elephant as the Indians so they needed to change the piece to something that people in Europe could relate to. The church was very powerful in Europe when these changes were going on. It's influence on political life in the Middle Ages was recognized when the piece became a bishop. The Europeans also wanted to speed the game up as they found it laboriously slow. The bishop was one of a number of pieces to see it's powers increase and it now had unlimited range on the diagonals. 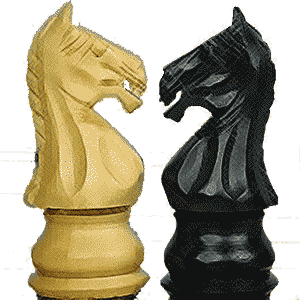 The term 'rook' is taken from the Persian word rukh which means chariot. In the ancient armies of India and later Persia, the chariots were used for their lightning speed on the battlefield. In other places that later adopted chess, such as Russia, the chariot became a fast boat. It was always represented by something powerful and dynamic. The Persian chariot resembled a small mobile castle due to the stonework on its sides. When chess came to Europe, the Europeans took this to be a castle or tower of some kind. The Persian word rukh even sounded like rocca, the Italian word for fortress. The piece became a castle referred to in English as the rook. The German word for it is turm meaning tower. The queen changed probably more than any other piece in the game. In India in the 6th Century this piece was a male advisor (vizier), not a queen. The king and the vizier would watch the battle from a vantage point. They would send instructions to the troops in the field. The vizier was weak, able to move only one square diagonally in any direction. When the game moved to Europe this piece became a queen as they were commonplace in just about every European country. In the Middle Ages, the Europeans introduced a raft of rule changes to speed up the game. They enhanced the power of a number of pieces. Due to the influence of Queen Isabella of Spain circa 1475, the queen was empowered dramatically. Her movement was amended to what it is today, unlimited range on the ranks, files and diagonals making her the strongest piece in the game. The king was the king right from the start. Neither has the king's movement changed. In variants such as Chinese Chess and others from South East Asia, the piece became a General. In Shatranj, a variant bridging Chaturanga and western chess, there was no stalemate rule. If the king could not move, then even if he was not in check, it was said to be checkmate. There was no castling. Taking all of your opponents pieces apart from the bare king was a win unless he could take your last piece apart from the king on the next move. That would be a draw. The Europeans introduced castling to make it possible to get the king safe in the new, speeded up version. They said that a king must be under attack to be in checkmate. If he was not the result would be a draw by stalemate. They also decided that a bare king was not defeated and had to be checkmated. A brief history of chess pieces. That's how all the pieces came to be. Natural selection in a way. Gradual modifications and improvements to the original game until we reached the present status quo. We now have a fantastic strategy game. How would you improve it? Hard to say really. Computers can show the best moves and continuations for any opening known to man. And yet the possibilities remain infinite. The nature of the game is that each move produces numerous possible continuations. Every door has several more doors waiting behind it. We've had a quick glance at each of the pieces in turn. Now we can look back on European chess from it's foundations to the modern day. Early on there wasn't to much heed paid to defensive considerations. It was a race to checkmate as players would go for the throat right from the start. Some beautiful combinations were played in what came to be known as the Romantic Era. This link takes you from History of Chess Pieces back to your Homepage. Your Homepage is where you get a site overview. There you can see all of the resources on offer in this web site.